Discussion in 'Apprentice Marijuana Consumption' started by godofallcows, Apr 22, 2010. So my friend took me along with him today and I met the guy who supplies him and got his number for future considerations. also, get a scale or borow one. i usually see if i get skimped once i meet a new connect, just to be safe. If I were you id deffinately get a scale just to be safe. Nothing crazy just a $20 scale or something like that. ya, we dont wanna see u here making a thread called 'did i get ripped off' with horrible phone pics of a bud next to a quarter [coin]. so please, just get a scale, it'll be ur best friend. Haha I probably will. I'm at a college though and apparently this guy is pretty cool. Texts you when he's out of town, tries to get what you want, etc... I think even today he gave me more than I paid for... 20$ for an 1/8th, it seems like a lot though. Also I just made this. Its from a Grape Royal Blunt Wrap (I know you all think they are stupid, but it was available and easy lol) 3 of us are gonna light up in a bit and play games/ listen to floyd. what kind of bud did u get for 20 a slice? What's that white tip on the blunt? probably some lower grade mids. just a guess though. it comes on black and milds, and other cigars. its a plastic mouthpiece and i hate smoking blunts with it still on. my friend loves keeping it on there but i wanna taste the blunt, not plastic. Meeting your first dealer, that's awesome, great news! Make sure you keep his secrets and stuff and he'll continue to be your dealer! this asian kid that thought he was ghetto sold it to me behind the KFC/Taco Bell outa his rice rocket. Its called popcorn, its mids-ish. Does the trick and its cheap! It came with some Shisha I had, they were supposed to be hose covers apparently. I like Floyd with surround sound very loud while watching visualizations on my 10 ft projected screen, yes. Not high? I like one song of theres. Whats wrong with the mouthpiece? 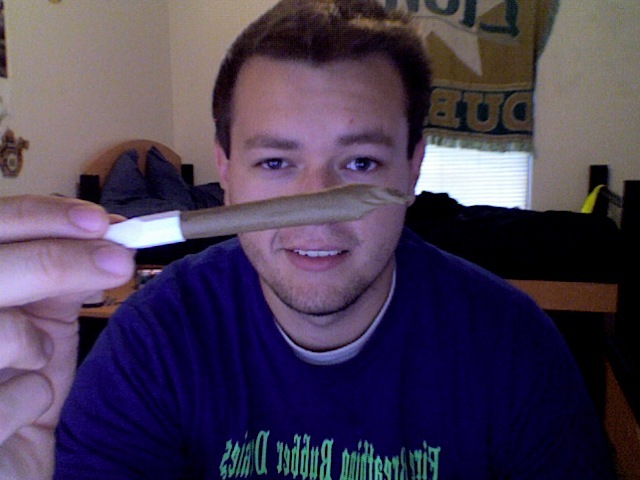 There is no filter and this is the first blunt I have ever rolled, it helped it stay together. First time you met Your/A Dealer.